Photos via the MTA and the History Channel. Behold! This morning the MTA unveiled the first "full advertising wrap of the exterior and interior of a New York City subway." Synergy alert! 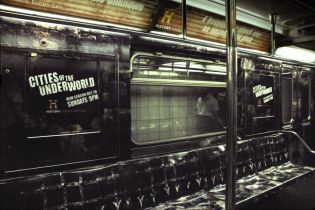 The ad is for the History Channel's Cities of the Underworld, which follows urban explorer Don Wildman on his adventures beneath major cities. Adventures happening ever further down from the ones New Yorkers experience on the 42nd Street Shuttle. The underground ad campaign is a bit underwhelming, but it is in an effort to further expand the MTA's advertising revenue base, and in addition they'll also be testing digital advertising on buses and in-car commuter rails. The MTA noted that they "will realize over $125 million in 2008 in advertising revenues. If these new initiatives are implemented on a permanent base, the MTA expects these revenues to grow substantially." Which could only help at this point.